This article is about a raised platform. For the character in Ronin Warriors, see Dais (Ronin Warriors). For the plant, see Senna covesii. Not to be confused with Dias. 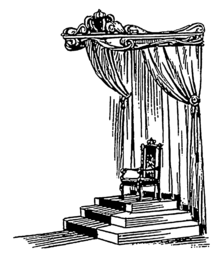 A dais (/ˈdeɪ.əs/ or /ˈdeɪs/, American English also /ˈdaɪ.əs/ but sometimes considered nonstandard) is a raised platform at the front of a room or hall, usually for one or more speakers or honored guests. Historically, the dais was a part of the floor at the end of a medieval hall, raised a step above the rest of the room. On this, the master of the household or assembly (e.g. the lord of the manor) dined with his senior associates and friends at the high table, while the other guests occupied the lower area of the room. In medieval halls there was generally a deep recessed bay window at one or both ends of the dais, which provided retirement or greater privacy than the open hall. The dais area often had its own doorway for admission from the master's chambers, whereas most of the guests entered through a doorway leading into the main area of the hall. 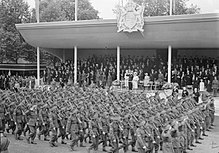 At military parades, the dais is the raised, sometimes covered, platform from where the troops are reviewed, addresses are made, and salutes are taken. It can also have stairs and a throne. In life drawing rooms of art schools, the platform where the model poses for the students is sometimes referred to as the dais. The first written record of the word dais in English ìs from the thirteenth century. It stopped being used in English around 1600 but was revived by antiquarians in the early 19th century with the disyllabic pronunciation. It comes from the Anglo-French deis, meaning "table" or "platform", which comes from Medieval Latin discus, meaning "table", earlier "disc" or "dish". One or more of the preceding sentences incorporates text from a publication now in the public domain: Chisholm, Hugh, ed. (1911). "Dais" . Encyclopædia Britannica. 7 (11th ed.). Cambridge University Press. p. 761. ^ "Dais". Online Etymology Dictionary. Retrieved 2012-06-22. "Dais" . New International Encyclopedia. 1905.